General Motors’ electric vehicle tax credit may soon run out, Fiat Chrysler’s new boss meets America’s boss, doubt over whether revised fuel economy standards will help workers—all this and more await you for The Morning Shift of Tuesday, Aug. 7, 2018. 1st Gear: Will This Hurt Bolt Sales? 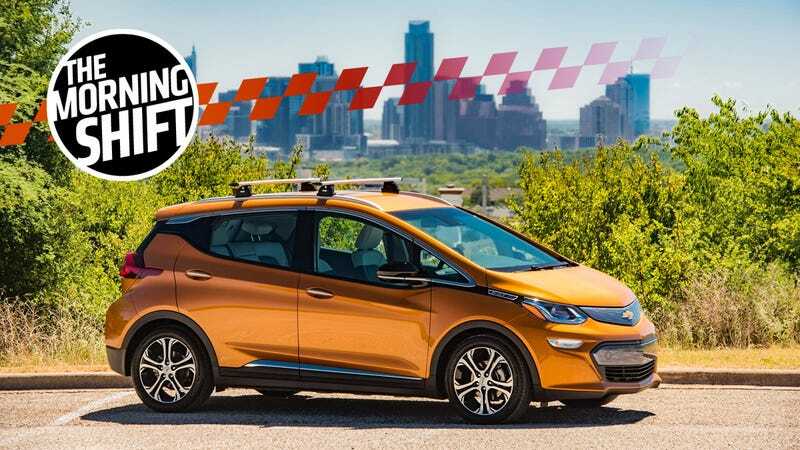 Lo and behold, sales of the Chevrolet Bolt—General Motors’ first full-on electric vehicle of the modern era—have actually been pretty good. And like most EVs, those sales have no doubt been helped by the $7,500 federal electric car tax credit. So if you’re looking for a Bolt, now’s probably the time to get one. The car starts at $37,495 and can easily get into the $40,000 range with options—that’s all before the tax credit. It’s a way better deal if you can nail one down with the credit in place. I’m actually driving one of them in New York this week and I’m enjoying it so far. I’ll let you know what I think in a full report next week. President Donald Trump will meet Tuesday with leaders from more than a dozen major companies, including Fiat Chrysler Automobiles’ new CEO Mike Manley and PepsiCo Inc.’s departing chief Indra Nooyi, as he shapes his economic message heading into midterm elections. The executives are traveling to Trump’s golf resort in Bedminster, N.J., where he’s in the middle of what the White House calls a working vacation. The president will be joined by aides including his daughter Ivanka Trump and son-in-law Jared Kushner; Larry Kudlow, his top economic adviser; and deputy chief of staff for policy coordination Chris Liddell. [...] Trump enjoys business leaders’ support for the tax law he signed last year and a deregulation agenda — policies his administration contends are fueling economic growth and low unemployment. But some CEOs have criticized his immigration policies and, especially, his trade war with China and U.S. allies. Good luck, Mike. Hope you can end up the favorite now too. Patel was let go for acting inappropriately, a source with knowledge of the situation said, although the nature of the behavior remains unclear. Efforts to reach Patel for comment were unsuccessful. Patel’s dismissal follows the February departure of Raj Nair, Ford’s president of North America, for behavior that Ford deemed “inconsistent with the company’s code of conduct.” Nair was Patel’s supervisor for a period of time. It’s not clear what Patel is accused of doing. Last year Ford also came under fire for what’s been reported as widespread sexual misconduct at two Chicago plants. In a report Tuesday, the Insurance Institute for Highway Safety criticizes Uber for turning off Volvo’s collision-avoidance technology in the XC90 crossover that struck and killed a woman in Tempe on March 18. The insurer group’s chief research officer, David Zuby, vouched for the effectiveness of Volvo’s system, saying it would have prevented or mitigated the crash. Police in June said the test driver was streaming a TV show on her phone before fatally striking 49-year-old Elaine Herzberg. Uber has since suspended much of its self-driving car testing. Neutral: Are CAFE Standards Good For American Jobs? Or will easing the fuel economy regs really spur more car production at home?